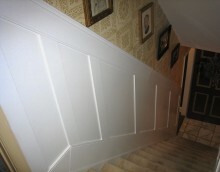 This is our inexpensive, easy-to-install, customizable wainscoting with a twist. It uses the same stiles and rails as our legendary Raised Panel Wainscot, except with flat panels made of 1/8"-thick high density fiberboard. This keeps the installation process super-simple and costs low, while also offering something else. Let's say you've got a wall with dented drywall, water damage or cracked plaster. Instead of repairing the flaws, cover them up with flat panel wainscot. The 24" x 24" panels easily hide tired stucco, divets left behind after prying off mirror tiles or cork, or cracked vintage plaster. If you've ever lived with the dust, hassle and expense of drywall repair, you already know why covering damage is often better than repairing it. Want something with a little more visual detail? Consider our Beadboard Wainscot. It's just like our flat panel designs, except with decorative vertical grooves milled into panel surfaces. Any casual living space is ideal for either beadboard or flat panel wainscot. And like all Elite kits, both options come in 8-foot lengths, factory primed and ready to install. Like the flat panel look, but your walls are still in good shape? 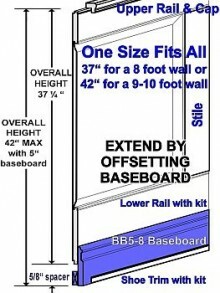 Save even more money with our Wall Panel Wainscot. 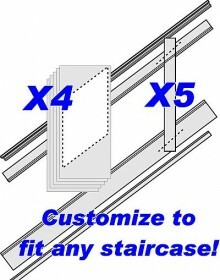 It's more economical and easier to install because it uses the wall itself in place of panels. Simply install the lower rail, stiles, upper rail and cap directly on the wall surface, then paint. Got questions? Great! Give us a call. We've got the answers.